As an accomplished public speaker, Mr. Day is experienced with audiences of all sizes. 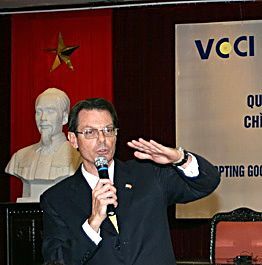 He is also a media commentator and film/television show host on international business topics in the Asia Pacific Region. Mr. Day is a master at creating unusual & engaging presentations. He is also well-versed in creating and delivering the exciting and challenging cross-cultural presentation–even through translators–before non-English speaking audiences. Please contact us for booking availability on these and other topics.